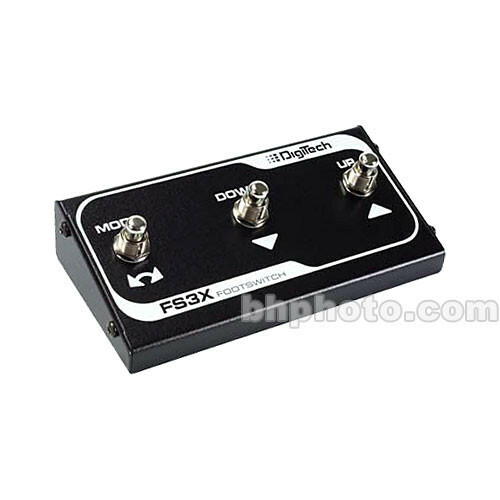 The Digitech FS3X Three-Function Foot Switch is a highly useful accessory that works with many Digitech products, including the Jam Man looper, EX-7 Expression Factory, the Jimi Hendrix Experience pedal, the Brian May Red Special pedal, and more. The FS3X provides hands-free control of model selection, mode changes, start/stop and auto-record, among many others. A 10-foot cord is included with the FS3X, so you can place the pedal where it's most convenient. Ruggedly built and flexible in its operation, the FS3X expands the functionality and ease of use of your Digitech pedals. Box Dimensions (LxWxH) 7.35 x 4.9 x 2.3"
FS3X Three-Function Foot Switch is rated 4.9 out of 5 by 7. Rated 5 out of 5 by Anthony B. from Very Helpful! When used with the Digitech Trio Band Creator Guitar Effect Pedal there is no need to bend down and adjust most of the settings. When I first purchased the Trio this was my biggest annoyance factor then I found out about this foot switch and it just made everything easier. Rated 5 out of 5 by Lazer from Killer Deal This is a special pedal for the JamMan looper - makes operation very simple. B&H had the rock-bottom lowest price between them, Amazon & ebay - and the shipping was free. Always check out B&H as first stop of online shopping spree. Rated 5 out of 5 by alvie666 from Sturdy and works as advertised Works just as it should with the Digitech Trio pedal. Rated 5 out of 5 by Pete from Well built The foot switch is well built and works great on both the Trio band creator and the digitech jamman. If you own either one I would get the foot switch. Rated 5 out of 5 by Anonymous from Bomb proof foot switch Product does exactly what it needs to do and works well with other equipment requiring same type of switching/connection. Rated 5 out of 5 by Anonymous from Foot Switch Work well on the looper, very easy to use.